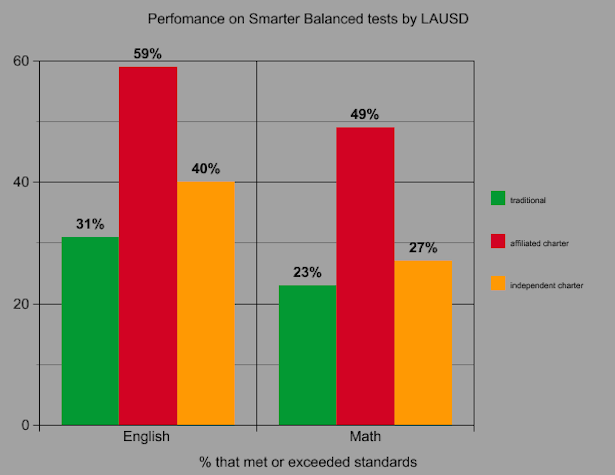 Students from LA Unified’s independent charter schools outperformed their counterparts at traditional schools on the recent Smarter Balanced standardized tests in the number meeting and exceeding standards, according to a new analysis by the California Charter Schools Association (CCSA). The charter group found that the charter students scored nine percentage points higher in English language arts but only four percentage points higher in math. The new analysis differs from a previous one by CCSA, in that it removes LA Unified’s 53 affiliated charters from the comparison, as the state does. Affiliated charters are district schools that operate with most of the same rules as regulations that govern traditional schools but with greater autonomy over spending decisions. Their teachers are union members. The district’s 211 independent charters are publicly-funded schools run by outside groups who have even more autonomy, and in most cases, their teachers are not union members. Students from affiliated charters accounted for only 22,750 of the district’s 267,228 students — about 8.5 percent — who took the tests, but they tend to skew the comparison because their racial and economic demographics do not match up with the district averages. They tend to have about half as many children from families living in poverty, with dozens of the schools located in more affluent neighborhoods of the San Fernando Valley. Including their scores with those from traditional district schools reduces the difference between independent charters to only a few percentage points. By removing them from consideration, the demographics of traditional schools and independent charters match up more closely. According to the CCSA analysis, LA Unified’s affiliated charters have 47 percent white students, 30 percent Latino and 7 percent black, compared with 7, 74 and 13 for independent charters and 7, 77 and 9 for traditional schools. “The main point is that autonomous charters, with nearly identical demographics, outperform traditional schools on both subjects,” the CCSA said in an email. The demographic differences are also noteworthy due to a very large achievement gap that black and Latino students showed on the tests compared with their white counterparts. Also affiliated charters tend to have fewer English-language learners, 7 percent, compared with 22 percent for traditional schools and 19 percent for independents. English learners also showed a significant achievement gap. The CCSA also pointed out that affiliated charters have 35 percent economically disadvantaged students, while traditional schools have 83 percent and independent charters have 82 percent. The relevance of these scores as they relates to charter schools is sure to be a hot topic for discussion in the coming months, considering the announcement recently from group of powerful foundations that are planning a major expansion of independent charters in LA Unified. The teachers union, UTLA, is leading a fight against the expansion even though the foundations have resisted providing any information about their intensions.